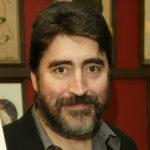 Alfred Molina is an English-American actor, known for his roles in Raiders of the Lost Ark (1981), Enchanted April (1992), Maverick (1994), Boogie Nights (1997), Chocolat (2000), Spider-Man 2 (2004), The Da Vinci Code (2006), An Education (2009), Prince of Persia: The Sands of Time (2010), The Sorcerer’s Apprentice (2010), Rango (2011) and Whiskey Tango Foxtrot (2016). He starred as DDA/Detective Ricardo Morales on the NBC police/courtroom drama Law & Order: LA and as Roger opposite Dawn French in the BBC television sitcom Roger & Val Have Just Got In. "The worst thing that an actor can do is go into any project with a lack of respect for the material. You can have an opinion about it, but you have to respect yourself in doing it."